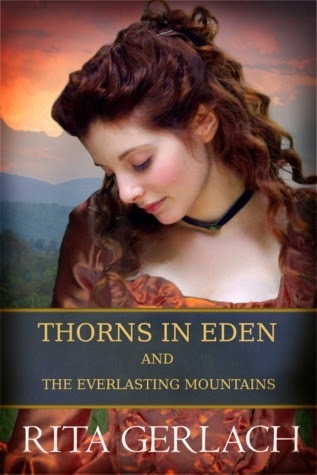 TODAY ONLY download Thorns in Eden and The Everlasting Mountains by Rita Gerlach for free! John Nash, has built a new life in the Maryland frontier, and journeys back to England to see his father before the first shots of the Revolution are fired. Rebecah, a young woman who has known little more than the solitude of an isolated manor has lost her father and is now under the control of a domineering patriarch. As their romance unfolds, they become trapped in the schemes of her uncle and immersed in one of the most infamous Indian wars in Colonial history. Can he protect his wife from warring Indians and from a man who has no allegiance to any nation, tribe, or creed, wanted for robbery and murder, who has vowed vengeance? In Thorns in Eden and The Everlasting Mountains, love and faith are the sustaining forces that cannot be overtaken by the vines of adversity.